One of my favorite things about our annual Green Issue is highlighting local pet businesses that are taking action toward a healthier planet. After all, we each have a responsibility to care for the earth which sustains us and the animals we love, whether in our personal lives or business practice. 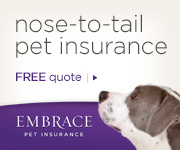 I am especially excited to feature our friends from Nashville Veterinary Specialists and Animal Emergency. You know them from our back cover, and you may know Dr. Trey Calfee as a leading orthopedic veterinary surgeon in Middle Tennessee. However, what you may not know is that this is one business that is serious about being green. Nashville Paw is proud to be Middle Tennessee's community pet magazine, celebrating the pet lifestyle and supporting animal rescue and welfare since 2006. All content copyrighted and rights reserved by Nashville Paw Magazine. Sign up for our free email newsletter to be the first to hear about local events, contests, pet tips + more!